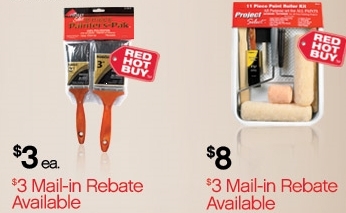 Remember that rebate deal on paint I told you about the other day? Well now we’ve got the painting supplies to go along with it. Submit the Ace Hardware Rebate Form for all the rebates at one time. And, if you have the $5 off $25 from the Entertainment Book you can cook up a great deal.